Please note as this studio is in a small residential street with school age children I do ask that you take extreme care when driving into and parking in our street. Thank you! Take a look through our photographic journey of establishing Serendipity Beads. 13th September 2011 - Display wall and cabinetry are mostly up - Yay! Strange how the cabinets although white come out grey in photo. Been an interesting experience trying to make the most out of a small space. How moving around the same items can give you a lot more or a lot less space. We are also thinking about changing how our original lighting ideas went now that more things are in place. 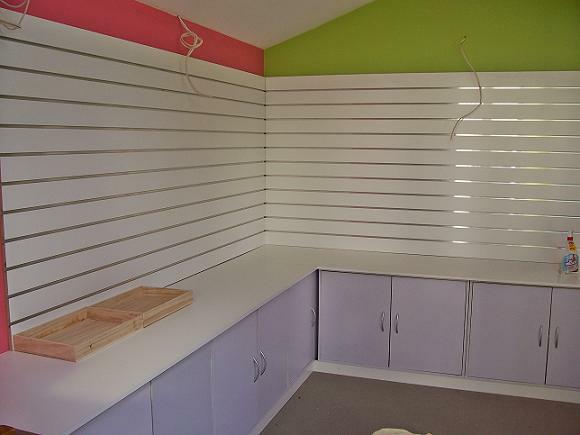 I can't wait until all the colours of the beads adorn these walls and shelves. 7th September 2011 - Here you go - a photo with the carpet, maybe not so exciting for you to see but very exciting for me as it means we are that much closer to getting things finished. The Beading Class table (which is round) will be going in the corner under both the windows. The Display wall is next to go up with the pelmet for all the lighting and wires to be hidden in to be made above the display wall. Storage and display cupboards have been purchased and need to be put together. I have started sanding and prepping the class table and chairs which need painting. 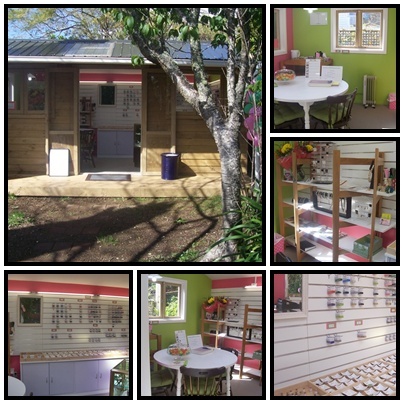 Glass display cabinet and other display furniture have been purchased (thanks Trade Me on my very tight budget) Need to purchase cash register (know what I need and where to get it just leaving it to last second), set up phone line with landline number and eftpos. Signage also still needs to be done but if you can cope with coming to visit before the signage is completed that will also be done later. Then it will be a matter of putting the stock in the shop and hoping there is enough to start with. Mind you it is only a teeny weeny studio so it will be cosy. Doesn't sound like much but we only have a few hours a week to get these things sorted. Thanks for hanging in there and it won't be long now before I can announce an opening date. 6th September 2011 - A gorgeous shot of our Cherry Blossom Tree shedding its flowers all over the lawn. This tree is only in flower for about a week and is a pain but beautiful for a short time. Blends in well with the pink wall. - coming tomorrow photos of the carpet laid. 28th August 2011 5:30pm - We have colour. 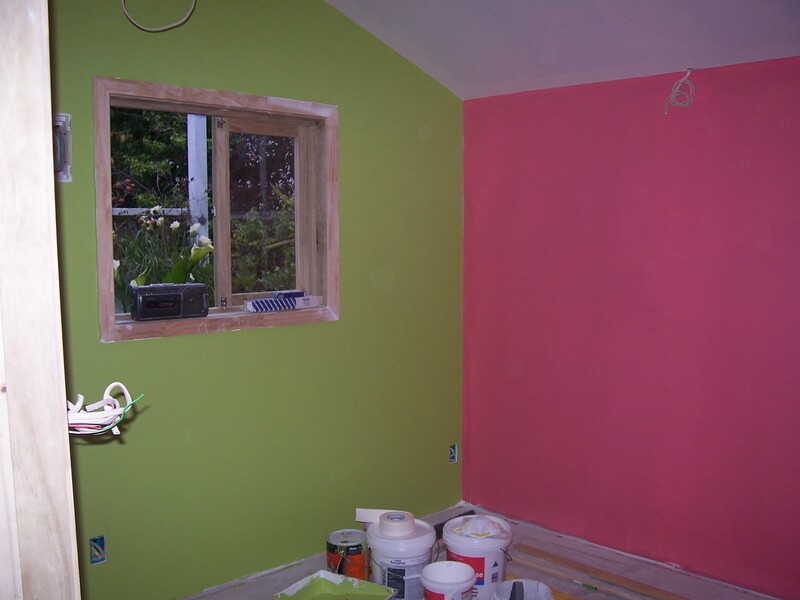 The two end walls have two coats of green and the pink is only one coat to date. 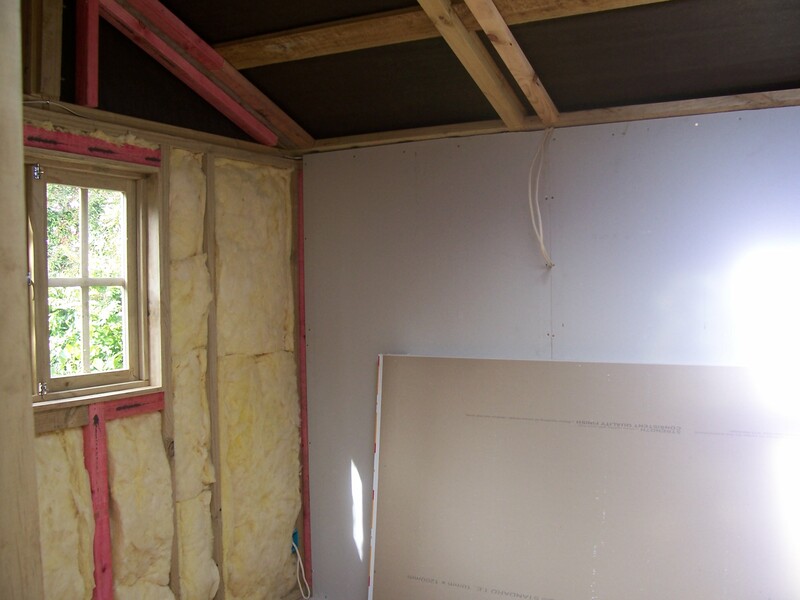 The large back wall will have white display wall covering most of the pink so it won't be so overpowering. So still have 2nd coat of pink, 2 coats of ceiling white, window sills and frames to paint. Skirting to be made, display wall to go up, boxing for all power cords to be made and rest of electrical work to be completed and then I can start putting things in place. Watch this space. 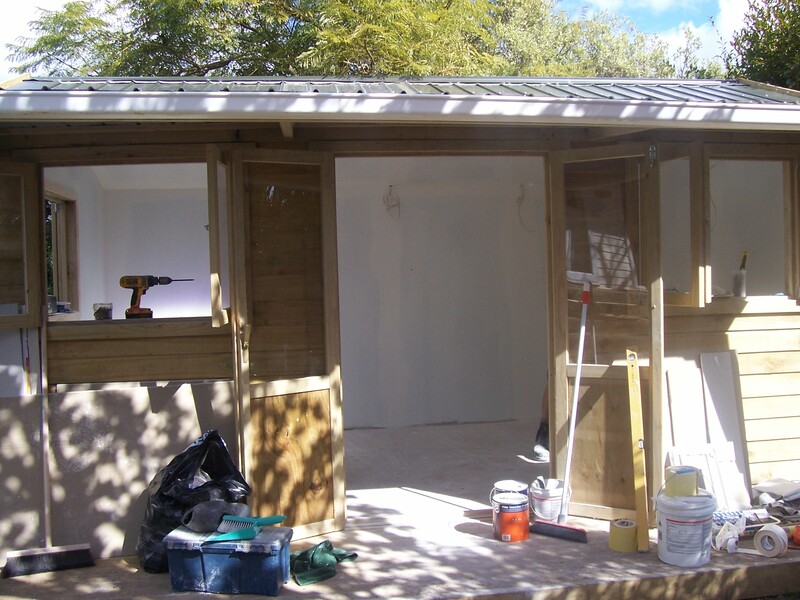 28th August 2011 - studio as at 2:30pm on this day with one coat of undercoat. I then went out for the afternoon. August 18th 2011 - Plastering is done just need to sand and paint now. Then carpet and all the fixtures and fittings before the stock can go in. Looking like a September opening at this stage fingers crossed. Keep looking back for updates. Don't forget to like us on Facebook to get more updates. 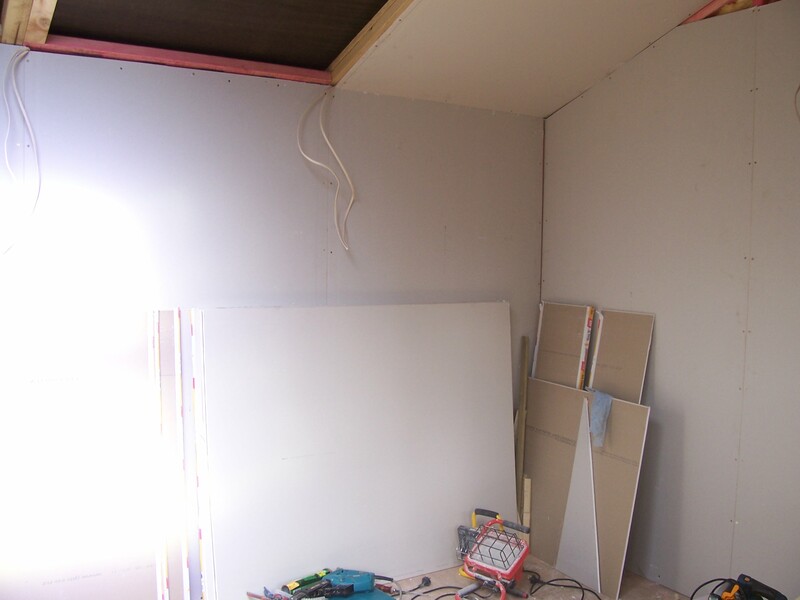 Below are the latest photos of where the shop is at (9th August 2011) It is becoming a frustratingly slow process as Craig is finding so many things wrong with the prefabricated building. These problems take so much time (extra framing timber mostly in pink) and delay the work progress. 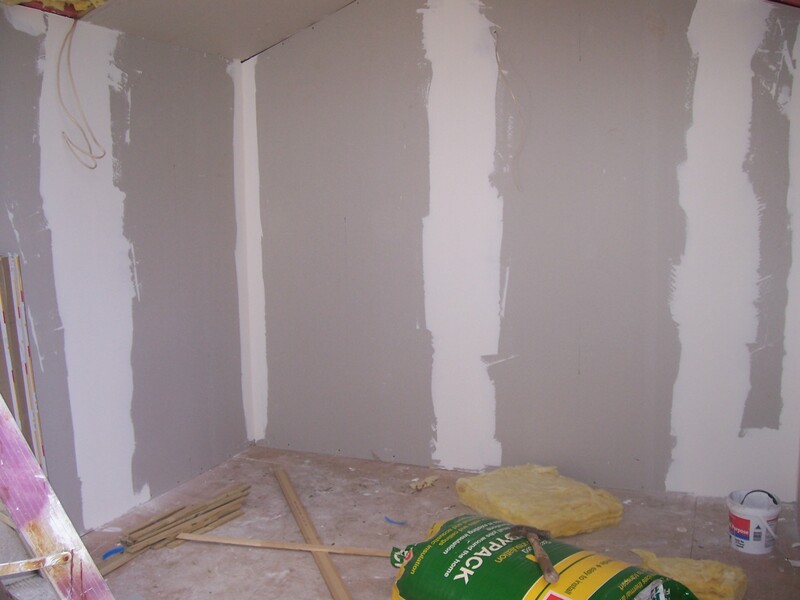 The gib has been started however and then it will be the plastering. The hard thing is Craig only has a couple of hours each weekend. Thank you to all of you who have phoned re opening hours etc, and for your patience with this project. Once I get a clearer indication of where things are at I will be posting when the shop will be opening. Don't worry none of you will be forgotten! 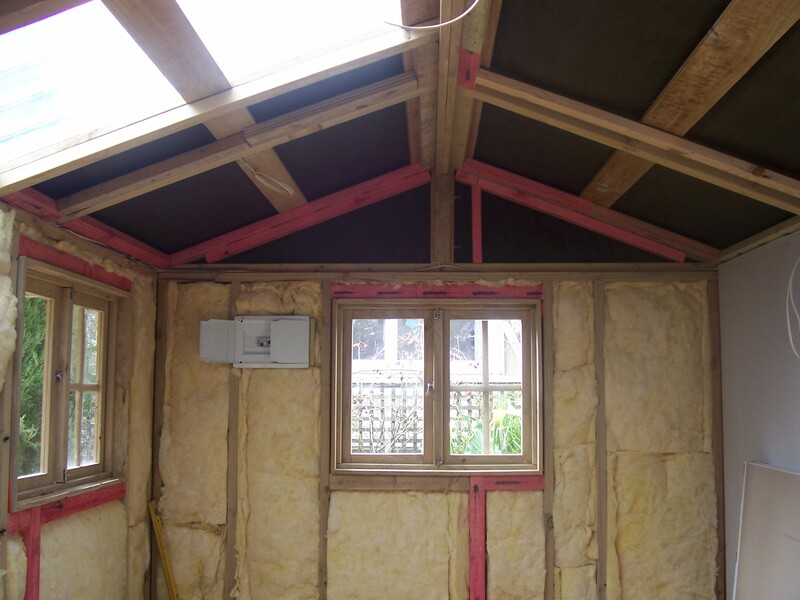 The insulation and part one of the electricity is in. Craig is exhausted from working full time and trying to get this done too. We are on holiday this weekend so it will be next week before any Gib goes up. 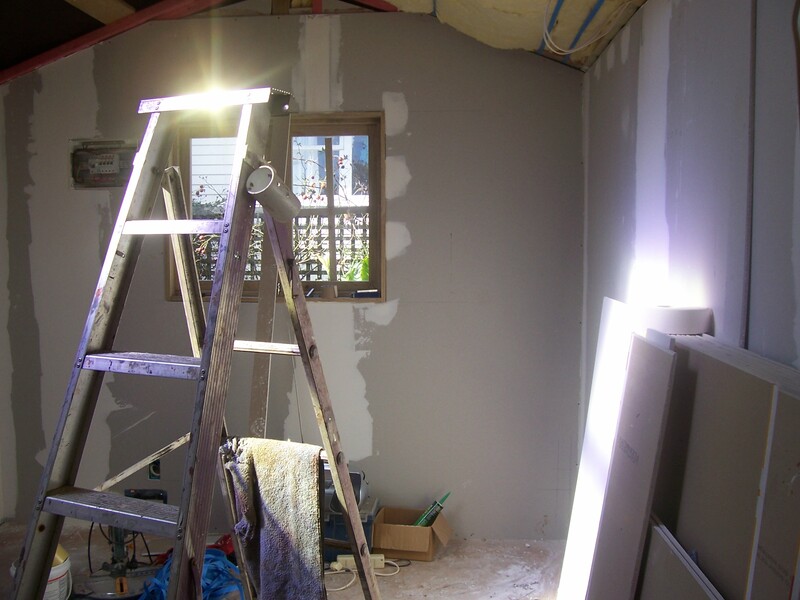 This is how the Studio/Shop is looking today 18th June 2011. Veranda and Spouting up! Very Exciting the Shop Framing is Now Up!! 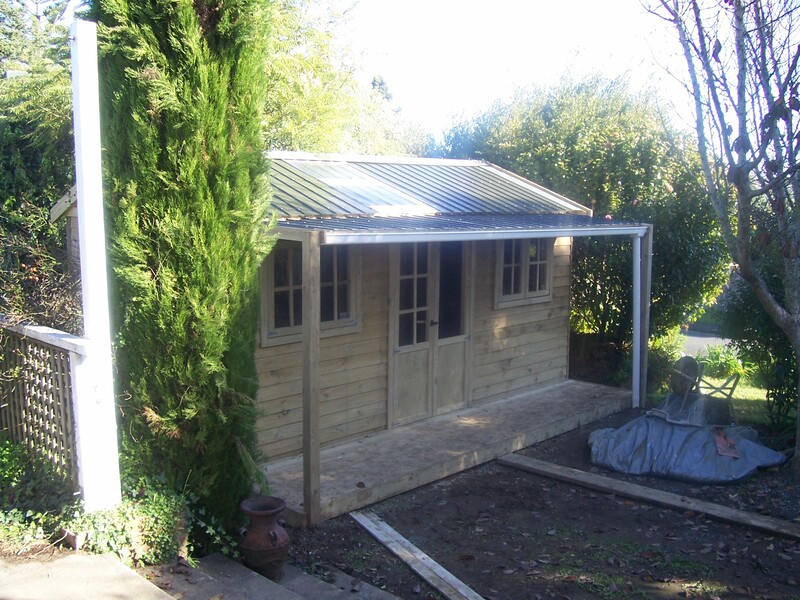 Well here it is - My beautiful framework for my Studio Shop. 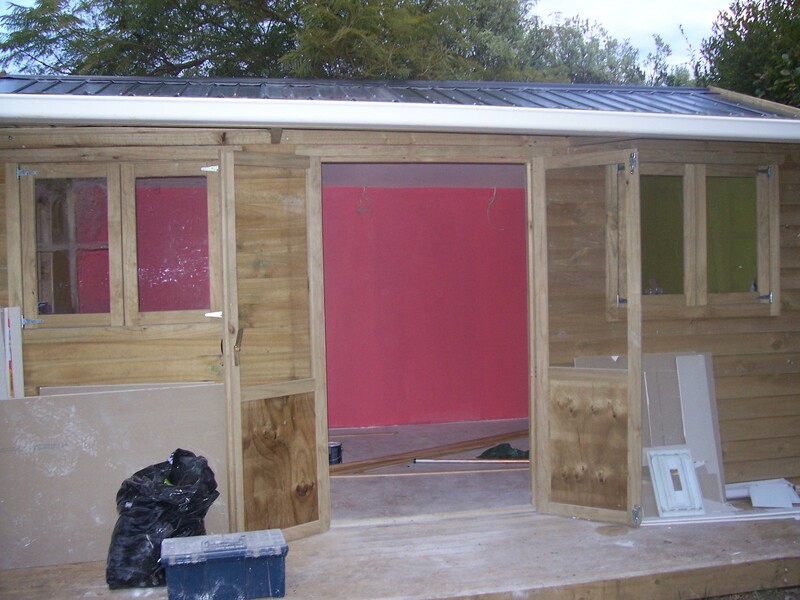 My husband Craig has been working very hard over the weekends to get the concrete pad laid and then last weekend (2nd 3rd July 2011) he got all the walls up and windows in. Monday morning he borrowed 3 more guys named Craig and Willy who works for our Home Maintenance Business (The House Mechanix http://www.thehousemechanix.co.nx/) to put the two halves of the roof on. It took 5 of them to lift each half. My Craig is standing on the step later in photo 3. Then they all went off to work. Yesterday 6th July we had Richard our Electrician around (Hill Electrical) to go through all the future proofing of what power/cabling etc will be needed now and in the future. Very interesting experience and fun to plan out how the shop will look. 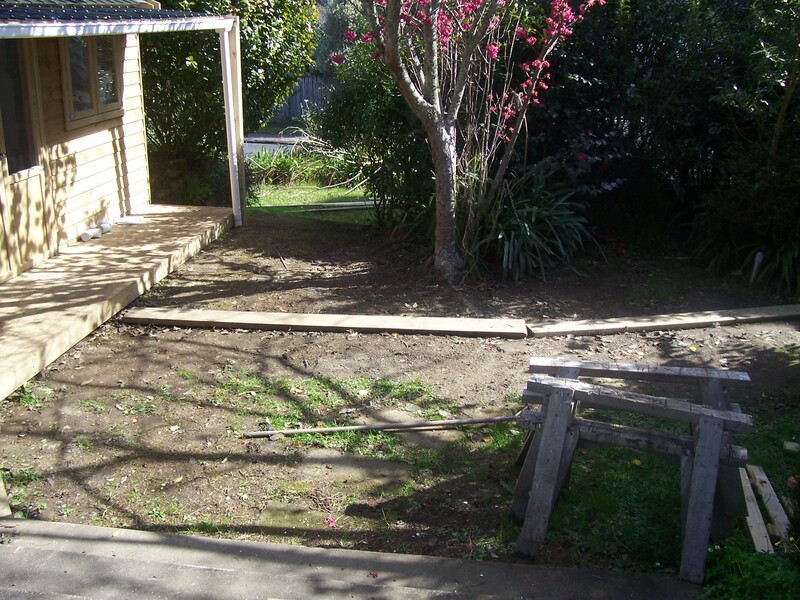 Last night Craig started putting the decking framing out and will try to get rest of deck done with its overhang veranda so will be able to post another photo after that. Hopefully after the school hols we will be fully up and running. Fingers Crossed anyway!